Adler's research is broad and deep. She has scoured archives in both Russia and at YIVO to bring to bear a detailed record of Jewish girls schools, a little known subject of historical study. Though over one hundred private schools for Jewish girls thrived in the areas of Jewish settlement in the Russian empire between 1831 and 1881, their story has been largely overlooked in the scholarship of Jewish educational history. In Her Hands: The Education of Girls in Tsarist Russia restores these schools to their rightful place of prominence in training thousands of Jewish girls in secular and Judaic subjects and also paving the way for the modern schools that followed them. Through extensive archival research, author Eliyana R. Adler examines the schools’ curriculum, teachers, financing, students, and educational innovation and demonstrates how each of these aspects evolved over time. The first section of this volume follows the emergence and development of the new private schools for Jewish girls in the mid-1800s, beginning with the historical circumstances that enabled their creation, and detailing the staffing, financing, and academics in the schools. Adler dispels the myth that all education in Russia was reserved for boys by showing that a dedicated group of educators and administrators worked to provide new opportunities for a diverse group of Jewish girls. In the second section, Adler looks at the interactions between these new educational institutions and their communities, including how the schools responded to changes taking place around them and how they in turn influenced their environment. Adler consults several major archives, including those of the former Russian Ministry of Education, along with contemporary periodicals, educational materials, and personal memoirs to provide a remarkably complete picture of education for Jewish girls in Russia in the mid- to late nineteenth century. 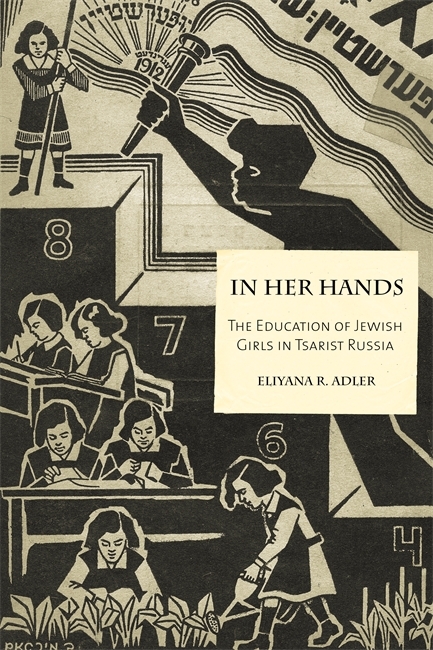 In telling the story of Russia’s private schools for Jewish girls, Adler argues that these schools were crucibles of educational experimentation that merit serious examination. Scholars of Jewish history, educational history, and womens’ studies will enjoy this pathbreaking study. Eliyana R. Adler is visiting assistant professor at the University of Maryland, College Park. She is the co-editor of Jewish Literature and History: An Interdisciplinary Conversation (University Press of Maryland, 2008) and the author of articles relating to Jewish life in Eastern Europe and the history of Jewish education. Adler's meticulously crafted story provides a remarkably detailed account of a neglected topic, the development of Jewish girls' schools in Tsarist Russia. In Her Hands reveals a previously unknown chapter of Jewish women’s history, emphasizing the role of Jewish girls’ schools in the modernization and transformation of traditional Jewish society. It is a formidable contribution to both Russian Jewish women’s history and to the history of Jewish education. Adler’s work will greatly benefit scholars of Russian and eastern European Jewish history and everybody who is interested in the topic. Eliyana Adler adds substantially to the literature about the history of Jews in the Russian Empire while doing her part to make visible a part of the narrative still too often obscured by a perspective that equates the history of Jewish men with the history of all Jews. Her carefully-researched monograph benefits from archival research in major Russian and Lithuanian archives as well as at the YIVO Institute in the United States. In her impressive monograph, Adler provides a nuanced and complex record of efforts to educate young Jewish women in the multi-ethnic Russian Empire. The book is well researched and well written and will surely be of use to scholars in Jewish education, Eastern European history, and Jewish life in nineteenth-century Russia. Adler’s work is a fine piece of historical recovery, greatly expanding our understanding of formal Jewish education for girls before modern Jewish politics capitalized on it in their attempt to conquer the Jewish street. The book adds significantly to our understanding of Jewish women in tsarist Russia, Jewish education, and modern European Jewish history writ large. To say that this important book by Eliyana R. Adler fills a gap is an understatement. I know of no other modern monographic treatment of Jewish women's education in Eastern Europe and this alone should make Adler's book essential reading in a number of fields. Overall, Adler's fascinating study provides an extremely engaging and important contribution to a much needed genre within (not just East European) Jewish history. It represents a compelling challenge to historians to take the educational theme much more seriously and will hopefully inspire other scholars and students to pursue the topic." Adler's research is broad and deep. She has scoured archives in both Russia and at YIVO to bring to bear a detailed record of Jewish girls schools, a little known subject of historical study." 2011 National Jewish Book Awards - Finalist in the category of Women's Studies.